Larrea tridentata is an evergreen shrub capable of growing in arid conditions where most other plants fail to thrive. Its natural range encompases parts of both the United States and Mexico. It is a prominent species in the deserts Mojave, Sonoran and Chihuahuan, but is found in arid lands outside these deserts as well. In the United States, Larrea tridentata grows wild in California, Arizona, Nevada, Utah, New Mexico and Texas. In Mexico, you’ll find it in Chihuahua, Sonora, Nuevo Leon, Durango, Zancatecas, Coahuila, and San Luis Potosí. In English, this plant is known as creosote bush, greasewood and chaparral. In Spanish, its called hediondilla and gobernadora. The name gobernadora, which means governess, and is an allusion to its ability to inhibit the growth of other plants and secure almost all the available water for itself. The whole plant smells of creosote, which is a carbonaceous chemical. This is the dominant scent in the characteristic “smell of desert rain” in the region. 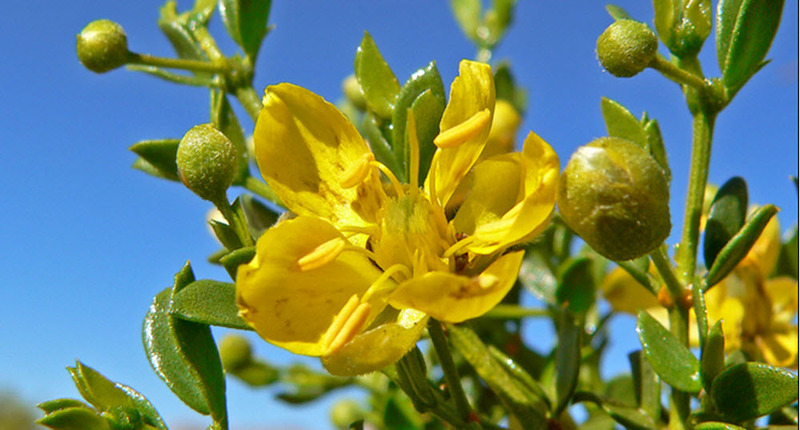 Native Americans in the southwest have traditionally used creosote bush as a remedy against various ailments, including sexually transmitted diseases, menstrual cramps, tuberculosis, and snakebite. The Pima made a concoction from the leaves and drank it to induce vomiting. Boiled leaves were applied to wounds and sores to help them heal. The Papago used creosote bush to releave menstrual cramps, to treat snake bites and to smooth stiff and sore limbs. 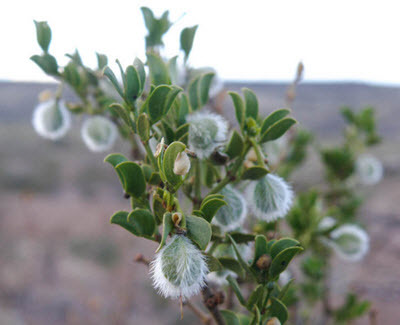 The Coahuilla took creosote bush when suffering from intestinal ailments, and also to relieve tuberculosis symptoms. Larrea tridentata is an evergreen shrub that typically reaches a height of 1-3 meters, but some specimens are taller than this. The leaves are dark green and resinous, growing to be 7-18 mm long and 4-9 mm wide. The flowers, which rarely exceeds 25 mm in diameter, have five yellow petals. The creosote bush is highly adapted to surviving in dry conditions. It’s native habitat consists of alluvial fans and flats, with soil that drains quickly. Mature and well-established creosote bushes can survive long periods of draught, and when the rains finally come, these plants can absorb the water very quickly and efficiently. To reduce water loss, the leaves are protected by a resinous coating. As a creosote bush grows older, the oldest branches will die and the crown will split up to form several new crowns. The new crowns are a clonal colony, as they all hail from the same seed originally. Exactly when this change occurs depends on various factors; it is sometimes seen in plants that are barely 30 years old, while other plants doesn’t experience it until they are 85 years or even older. Creosote colonies can be very old. The King Clone creosote ring growing in the central parts of the Mojave Desert in California is roughly 11,700 years old, making it one of the oldest living organisms on our planet. The average diameter of the ring is 14 meters / 45 ft.